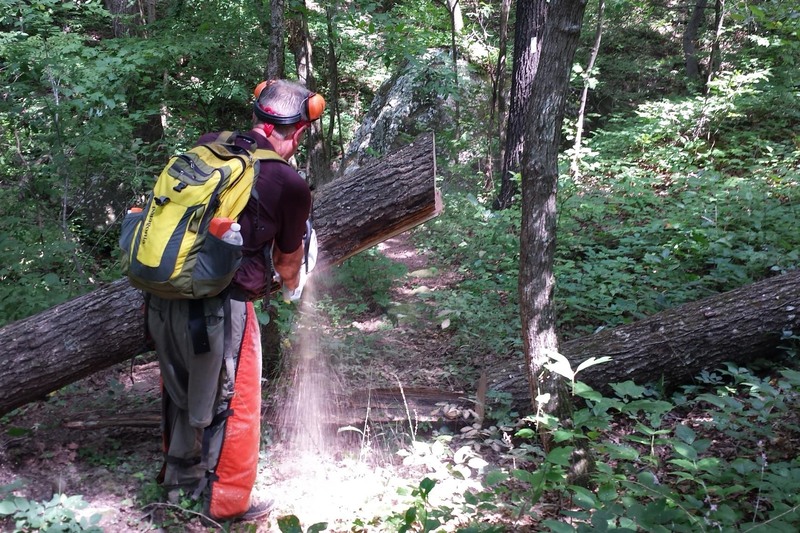 A few weeks ago I was appalled to find some major tree blowdowns on my adopted section of the Ozark Highlands Trail. I’ve bragged that since my section follows the Jack Creek drainage, it’s protected from winds and ice. We weren’t so lucky this time. From the pattern of downed trees, a microburst must have passed through a portion of the area and dipped into my quiet little valley. Large trees fell like dominoes, some across the trail. Mike LeMaster and I decided to work this section from Dockery Gap (approx. mile 10.5) west to around mile 6. Out-and-back, this came to around 9 miles with numerous stops to cut and clear. 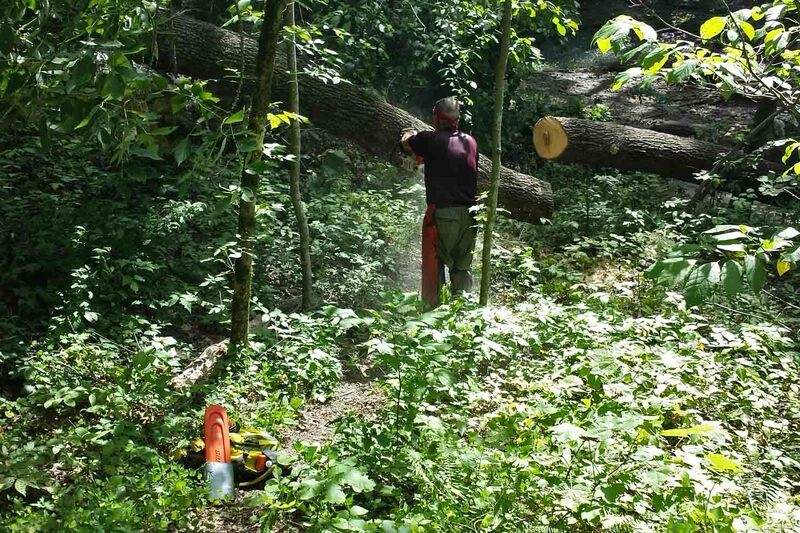 Mike likes doing some trail maintenance in the summer to stay in shape for the busier maintenance and hiking months in the fall. We got a good workout on this day! Mike cutting the first tree encountered. We found several large trees across the trail between mile 9 and 10, but this wasn’t the worst of it. 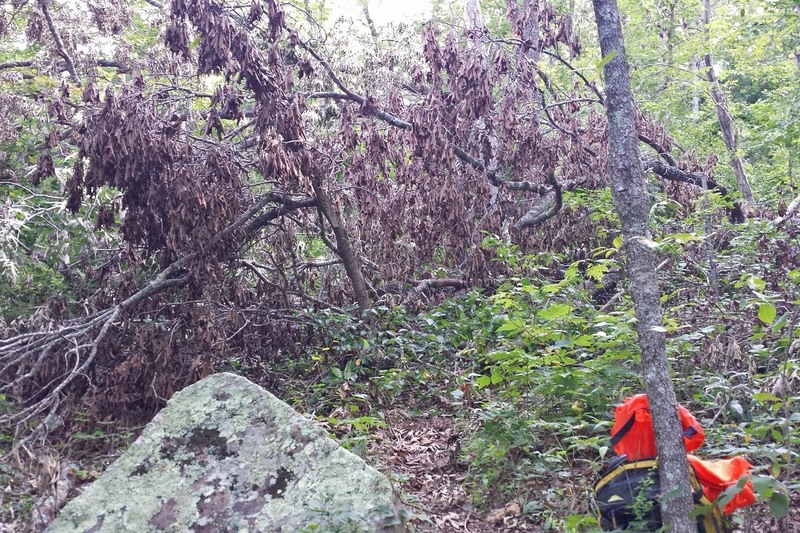 Before photo: Typical “blowdown” encountered on the trail. This was the scene in several spots on the trail. 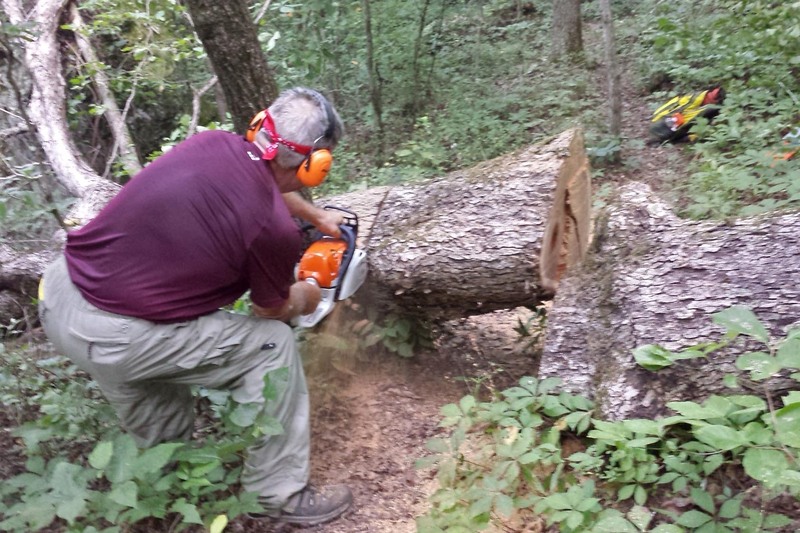 We first had to determine the trail route through multiple downed trees and then Mike began to do his chainsaw magic. My job as “swamper” was to pull stuff off of the trail and stay out of the way. This large trunk was head-high across the trail close to a creek crossing. One of the things I asked Mike to agree to was that I carry the chainsaw. It was the least I could do after he sawed on this July day with a heat advisory in effect. 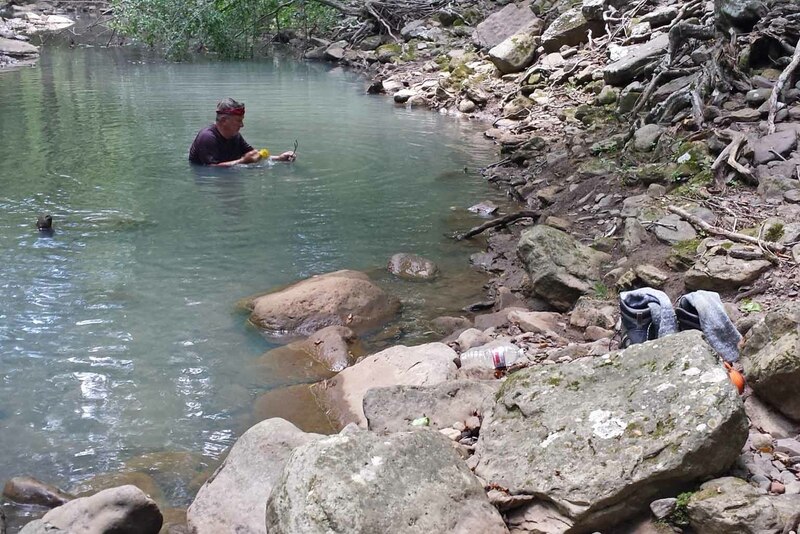 I later learned that Mike was looking forward to a cool dip in Jack Creek at the far end of our maintenance route. I was looking forward to filtering a fresh batch of water (upstream from Mike) for our return hike to Dockery Gap. It was nice to cool off and unusual to have so much water in the creeks in July! 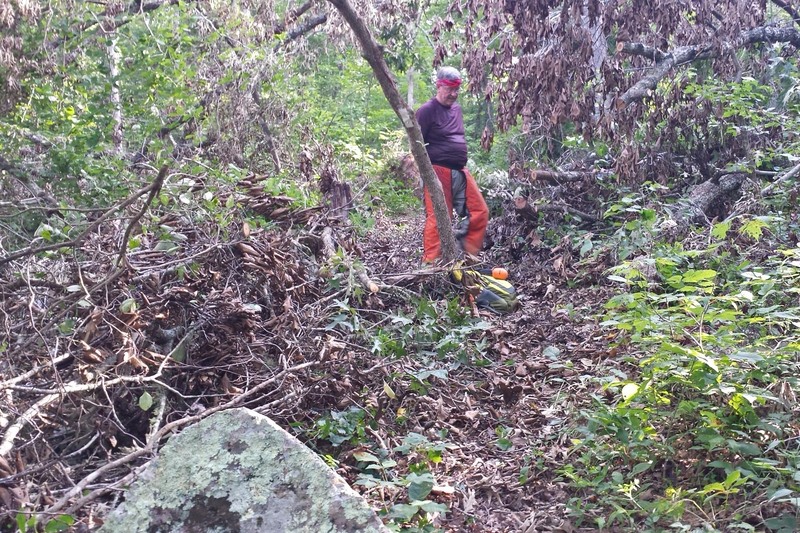 I want to say a big thank you to Mike for braving the heat and helping me with my section of trail. As a board member of the Ozark Highlands Trail Association (volunteer position), he takes a hands-on approach to leadership! It felt good to walk back through the areas we’d cleared earlier. While working this section, I concocted a plan to backpack from Lake Fort Smith to White Rock Mountain and on to Fane Creek in the fall. Can’t wait to see this area again….in cooler temps! This entry was tagged Mike LeMaster President of OHTA, Ozark Highlands Trail, Ozark Highlands Trail Association, trail maintenance. Bookmark the permalink. Thanks Mike and Jim for your hard work. Cindy and I will be checking out all of your hard work in September, when we do our thru-hike. Derrick – Maybe rethink September? Try late October for a much better experience. Still have to work for a living, so the hike has to fit into the work schedule.